With earnings season getting underway, October is an important month for these three defense stocks. Defense stocks haven't really had a very good year. With only a few exceptions, most defense stocks are relatively flat since January, and nearly every defense stock has fallen by double digits from its 52-week peak as of this writing. Furthermore, the industry as a whole continues to trade for above-average valuations, at least based on their historical ranges, and that probably means it's more a space to watch today than one to buy into. For instance, Northrop Grumman Corporation (NYSE:NOC), as a highly valued and highly profitable defense contractor, could be in for a reckoning based on changes in its recent business mix. But at the same time, there's some interesting opportunity, such as highly diversified Boeing Co. (NYSE:BA), which isn't cheap by any means, but has a massive commercial aviation business set up for decades of megaprofits, while BAE Systems (NASDAQOTH:BAESY) continues to trade for a far cheaper price than its peers, while being on track to deliver improving results. If you're looking to the defense industry right now, keep reading to learn why three seasoned Motley Fool contributors tagged these as defense stocks to watch in October. Is this the month Northrop Grumman gets its wings clipped? Rich Smith (Northrop Grumman): If I'm being honest, I'm going to be watching a lot of defense stocks in October. You see, July was the last round of defense company earnings reports -- and three months on, that means that October is the month when most defense companies can be expected to next report earnings (this time, for Q3 2018). That being said, if forced to pick just one company to watch, I'm going to focus my efforts on Northrop Grumman. Why? Because margins, that's why. I've mentioned a couple times already how Northrop Grumman's profit margins were at or near all-time highs. According to data from S&P Global Market Intelligence, Northrop's last 12 months showed the company earning literally historic all-time high operating profit margins of 13.3%. Northrop's only hit that number once before -- ever -- back in 2014. The fact that it's back at 13.3% today tells me something's probably got to give. Defense stocks are cyclical, and Northrop can't maintain this level of profitability indefinitely. My hunch? With sales of aerospace systems making up a larger and larger proportion of Northrop's total sales, and sales of the more profitable mission systems division growing more slowly, this is the quarter we'll see Northrop Grumman's average profit margin begin coming back down to Earth. Tyler Crowe (Boeing): You could say that I'm highly skeptical of investing in pure-play defense stocks right now. Even though all of them have had a relatively good run in recent years thanks to a larger Pentagon purse and its proclivity for new, expensive toys, there are a couple of things that give me pause. One is that hyperpartisanship could lead to wild gyrations in budgets in the future. The other is that, on the whole, defense stocks look pretty expensive right now. So when looking at the defense industry, it makes sense to find companies with a significant presence in the defense sector but don't wholly rely on the Pentagon (or foreign equivalents) to make hay. That's what makes Boeing rather compelling. These last couple of months have been full of new defense contract rewards for Boeing. Since the end of the prior quarter, it has booked close to $22 billion in new awards ranging from a new trainer aircraft, helicopters, and refueling drones. It will likely take several years for the company to fulfill these contracts, and it's possible that it could face profit problems in defense as it has with its KC-45 tanker, but they are considerable adds to its defense backlog. More important to its stock, though, is the company's considerable backlog of commercial aircraft and ramping up its efforts to crank out more and more of its 737 and 787 Dreamliners. Higher production rates have helped improve profitability and it puts the company on a path to meet CEO Dennis Muilenburg's goal of lifting Boeing's operating margins. Admittedly, Boeing stock isn't exactly cheap today, but 23 times earnings for this stock isn't absurdly expensive, either. It may not be a screaming buy, but it certainly looks attractive among its defense stock peers. Jason Hall (BAE Systems): Just last month, I identified BAE Systems as a defense stock investors should keep an eye on due to its solid business prospects and excellent valuation. An interesting thing has happened since: BAE Systems' stock price is down about 7% since peaking in mid-September. But nothing has fundamentally changed with the business itself, which is still built on a number of rather diverse offerings for air, sea, land, and cyber defense. It still has that big $26 billion deal with Australia set to drive growth over the next decade, and continues to reel in small deals to equip its western military clients to augment the bigger contracts, which ebb and flow with defense spending cycles. 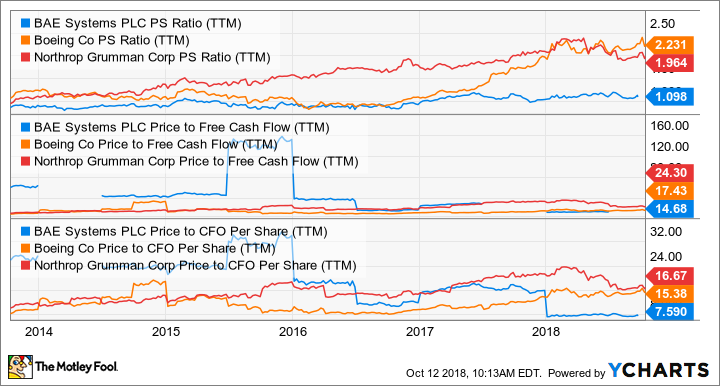 With the recent sell-off, BAE Systems stock trades for about one times trailing sales, less than 15 times trailing free cash flow, and less than eight times cash from operations. While its lower-margin results in recent years should cause it to trade at a discount to its peers, I think the market is discounting a high-quality business by too much right now. That's especially true with management taking steps that should lead to better profits in the years ahead. Not only does BAE Systems belong on your watchlist this month, particularly with earnings around the quarter, but it may be worth buying already.